Have you always dreamed of riding a horse along the ocean at sunset? Are you looking to give your kids or grandkids a unique and fun beach experience? Is horseback riding on the beach on your bucket list? If so, you’ll find what you’re looking for on the south end of Bandon at Bandon Beach Riding Stables. All ages and abilities are welcome as the folks at this small family owned company work hard to accommodate everyone, including disabled riders. The guides on staff take time to choose appropriate horses for everyone based on age and experience, and they patiently give instruction on the basics of riding to put everyone at ease. Children under five ride double with an adult, and older children’s horses can be led by one of the guides. The horses know their way around this business as well. They are familiar with the beach and with carrying different riders and don’t stray from the course. During the ride, your friendly guides will help as needed. They will entertain you as you ride with information about what you see on the beach as well as local folklore explaining the origin of some of the rocks. They also know when to let the scenery do the talking, giving everyone opportunities to enjoy some serenity. 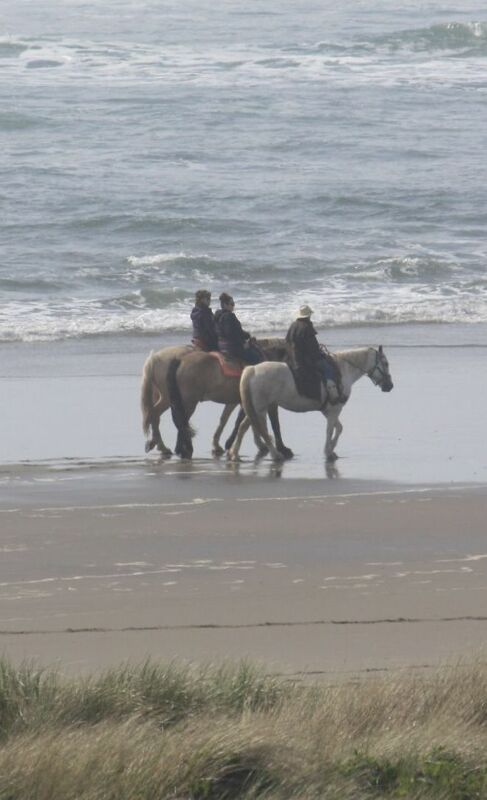 Bandon Beach Riding Stables offers two different riding experiences, both entirely on the beach except for crossing the road to get there. The North Beach trip consists of three miles of riding and takes about an hour. Weather permitting, there are several trips a day, starting at 10:00, 12:00, 2:00, and 4:00. The Sunset Rides are available May through September and begin at 6:00 p.m. They are 4 miles long and take 1.5 to 2 hours. Both trips feature tide pools, creek crossings, beautiful rocks and caves, and of course views of the Pacific Ocean. The beach is not a terribly crowded one, and at times, riders feel they are the only ones there. The horses you will be riding are very good at their jobs. They are calm, well-behaved and friendly, and they are accustomed to nervous and confident riders alike. Being well-loved as they are, it is likely not difficult for them to be so personable. Bring your camera for some amazing horse and beach pictures, and be sure to dress in layers. Although it may be warm at the stables, as soon as you cross the road and get down to the beach, it can feel much cooler and will likely be breezy. Bandon Beach Riding Stables offers more than just horseback rides. Also available is wagon rides on the beach for weddings, birthdays, parties and parades. They can also be hired for overnight pack or hunting trips. The stables are open daily and year round, weather permitting. Be sure to call before heading out there to make sure there is a ride available for when you want to go. Bring a few extra dollars; if you are as satisfied as other Bandon Beach Riding Stables customers, you’ll want to show your appreciation for their personal service with a tip!